The Historic Centre of Morelia contains 249 historic buildings, all made out of characteristic pink stone. The town started out in 1537 with a Franciscan monastery, and has played an important part in various stages of Mexican history since. In 1578, its name was changed to "Valladolid". During the colonial period a number of religious orders established themselves in the city, allowing it to take an important place in the history of art and culture in Mexico. 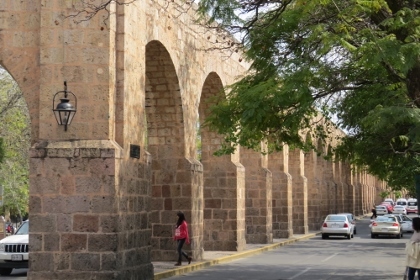 Important architectural sites from the colonial period include the Catedral de Morelia, the Aqueduct (built between 1785 and 1789 by Fray Antonio de San Miguel), the Governor's Palace, the Palacio Clavijero, and numerous churches, convents, and houses. 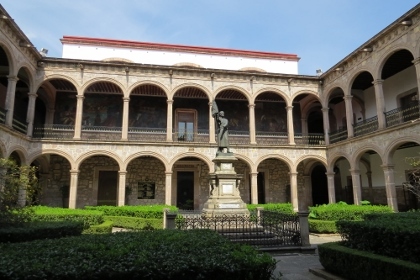 The Conservatorio de Música de las Rosas of Morelia was the first music conservatory in the Americas. The city is the birthplace of José María Morelos (1765), after whom it was renamed in September 12, 1828, and who along with Miguel Hidalgo y Costilla began the Mexican War of Independence from Spain in 1810. I repeated my parking trick from San Miguel de Allende, and left my car this time at an even bigger mall on the ring road of Morelia in the direction of Patzcuaro. This mall (Plaza de Morelia) has a couple of American franchise restaurants, and I ate a good salad at one of them for lunch. Morelia is a large city, and the WHS area stretches a long way across town. There are two central areas to check out. The first center is the Cathedral area. I was the only tourist around, and people did look a little bemused when I took my camera out of my bag. There are some fine facades around here, and arcades that came right out of Spain. Worth a peek inside is the Colegio de San Nicolas de Hidalgo, formerly one of the most prestigious schools of colonial Mexico. From that area, I walked to the second center which lies near the Aqueduct. The Aqueduct is… an aqueduct, what’s more to say. In front of it stands the also very underwhelming Tarascas Fountain. The city is very busy with cars (as all Mexican cities are), and they speed past the fountain and the aqueduct. I left the best for last: the Santuario de Guadelupe looks like a bland parish church from the outside. The interior is spectacular however: bright pink and light blue, it looks more like a Hindu temple. 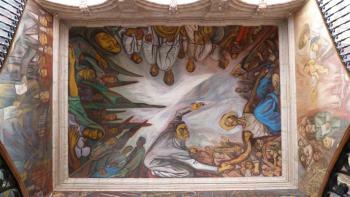 It also has 4 huge paintings on how the Spanish converted the poor indigenous Mexicans. Planning our trip around central Mexico, I assumed there would come a stage where our interest in historic city centres would run out, well it did and Morelia was the place that fell victim. We didn't do the city justice, we stopped for an early lunch on an overcast Sunday morning, meaning that many of the church interiors were out of bounds as they were being used by the large congregations. We had a stroll around the city centre, hunting out a cash machine, before sitting in a cafe to watch the locals ride bikes along the Zocalo which had been close to cars. The most impressive thing in the centre we saw was the governor's mansion, which was decorated with impressive murals. A really impressive undertaking, but amazingly it was par for the course for Mexican municipal buildings. After a quick wizz through the convent turned folk art museum we headed out towards the aqueduct, and like Els were somewhat underwhelmed by it. We also managed to peek inside the glorious Santuario de Guadelupe before realising the service was going on and tried to leave the congregation in peace. So that was about it, I can see that Morelia may reward a longer stay and that we didn't do it justice, however it really didn't grab us during our visit. Morelia, is a romantic untouristed city of a million people that feels more like 100,000. Rich in color and history, you will feel safe exploring its "Cantera Rosa" (Pink Stone) downtown neighborhoods and central plaza. The Morelians are friendly educated people who adore their community. There is so much to do and see in this clean, beautiful city, I especially enjoyed the vibrant "Candy" market and variety of art galleries. I'm returning again in the Spring! Among the somewhat excessive number of Mexican historic “colonial” town centres on the UNESCO list Morelia’s special claim lies in is its very “Spanish” feeling/atmosphere. As the Rough Guide says “you might easily be in Salamanca or Valladolid” – and indeed the city had this latter name for almost 300 years until it was renamed after the local Independence hero (whose birthplace in the city centre is something of a shrine and worth a quick visit). The city is pleasant enough and one certainly wouldn’t say “Don’t visit it” but it is difficult to put one’s finger on any particular attraction. 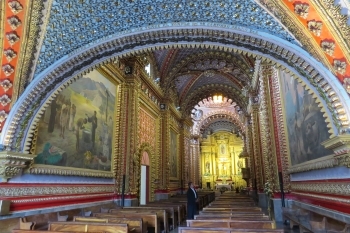 It has an enormous late 17th/early 18th century cathedral (photo 1) but this lost most of its riches to pay for Mexico’s wars and now has a late 19th century interior. The inscription emphasises the overall unity of the centre in design and appearance and this has certainly been maintained everywhere in a slightly “blocky” way (photo 2). Our hotel, 2 blocks behind the main street, was not an old building but was faced with the ubiquitous reddish stone – from the back however it was grotty red brick! There are however many genuine old buildings built on a grid pattern which still follows the original plan – it is interesting to read on the tourist “plaques” the detailed instructions sent out by Philip II as to how “exactly” cities in the New World were to be laid out and the buildings designed – real micro management! The main street is wide with imposing colonnaded structures and huge squares. Behind, the streets are narrower and one comes across old convents and churches, pleasant squares, small gardens and fountains. The city has a population of over 1 million and a significant university – as such it has the “mass” to support a pleasant café culture, restaurants etc. After an evening and a morning in Morelia we moved on to nearby Patzcuaro – a more indigenous and atmospheric town with adobe walls, cobbled streets and red tiled roofs. 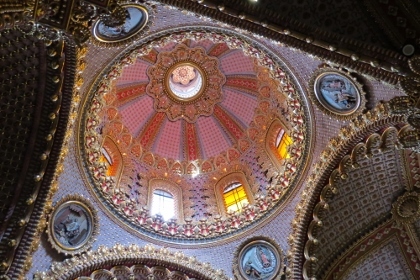 It is the antithesis of Morelia’s grandeur, rigidity and “Spanishness”. 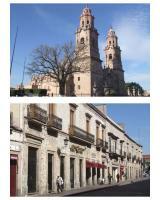 However, this Michelin *** town (as opposed to Morelia’s **) is not UNESCO-inscribed nor on its Tentative list. For a tourist visiting Mexico I would suggest that it is by far the more interesting and beautiful and I wonder why it is being ignored “World Heritage-wise” whilst Mexico gets so many of its more “Spanish” colonial cities inscribed? Universities: Universidad Michoacana de San Nicol?s de Hidalgo. It was founded in 1551 as the Colegio de San Nicol?s by Vasco de Quiroga, first bishop of Michoac?n. It is one of the oldest universities in America and one of the most important public universities of Mexico.